HLD is about balancing the whole system of water, surfactant, oil, temperature and salts - the task that formulators really face. 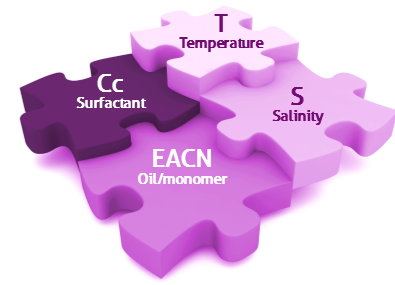 If you know the temperature T, salinity S, the oiliness EACN of the oil and characteristic of your surfactant Cc then you can tell where you are in terms of getting the balance you need for your formulation. When HLD=0 you have balance. This may not be where you want to be, but it's a unique reference point in surfactant space. HLD is what HLB should have been: a generally useful, scientifically meaningful approach to surfactant formulation. Given that we want to use our surfactant most efficiently, we want to ensure that the head and tail are nicely balanced within the whole formulation so that the surfactant resides mostly at the interface. Another way to look at this is to think of the four components as part of a jigsaw puzzle - they need to be locked together for success. 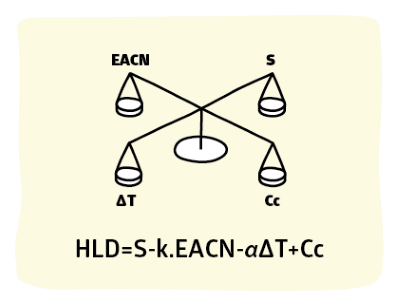 I love this image, used with permission from VLCI in Amsterdam who are experts at measuring EACN and Cc values and using those numbers to help clients apply HLD-NAC theory for improved formulations. Those who formulate with alcohols (calling them "co-surfactants") will be disappointed to see them excluded from this list. There are 2 reasons. First, formulation with alcohol is often a desperate measure in the face of the wrong choice of surfactant. Second, there are not enough data out there to include in any workable model as the effect of each alcohol is different. as S increases, HLD increases; the F(S) means "a function of Salinity" - for non-ionics it is 0.13*S and for ionics it is ln(S+SurfSal). 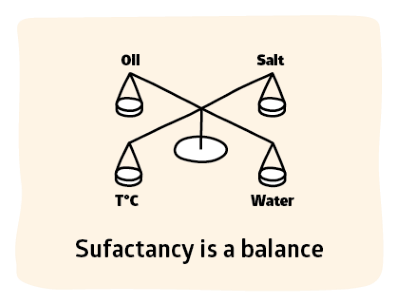 Because an ionic surfactant adds to the salinity (the rule of thumb is that it is equivalent to 30% of its molar equivalent to NaCl) the % Surfactant and its MWt combine to create SurfSal. So for a very oily oil (high EACN) you need either a high salinity (salt drives the surfactant towards the oil), a high Cc (a hydrophobic surfactant) and for an ionic you need a low temperature (because high temperatures increase water solubility) and for ethoxylates you need a high temperature (water solubility decreases with increasing temperature). But anyone who works with surfactants knows that! Of course. But the point is (a) that now you see that the equation fits in with your intuitions and knowledge and (b) you have an actual equation to do the calculation. Let's see it in action. Choose a type of surfactant (ionic, ethoxylate, other) to automatically give you the correct F(S) and the correct value for α. Now change the other values and see what happens to the HLD. Although the equation is simple, if you are like most of us it still takes some effort to get used to what happens as you change each parameter. 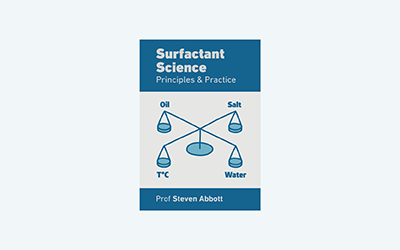 You can get quite easily lost in surfactant space. That makes a very powerful point. Getting lost in surfactant space when you have a formula is not too bad. What is really bad, and all too common, is when you get lost in surfactant space on the formulation bench. The point of HLD is for you to explore surfactant space before you go to the bench, so your bench work will be much more effective. Before exploring more about HLD we need to be clearer about assigning numbers to oil. Click on the EACN link to discover more. Strictly speaking, the use of Type I and Type II applies only to microemulsions. For "real" emulsions the terms o/w and w/o are sufficient. However, one of the many strengths of HLD-NAC theory is that it can be applied equally to optimisation of microemulsions and real emulsions. It is therefore convenient to keep the Type I, II and III nomenclature even when we are trying to create real emulsions. The justification for this will become apparent in the rest of the site.